Many freshmen business students moved into Brown Hall on Aug. 16. After hauling boxes, bags and microwaves to their rooms on a hot and humid day, they were greeted by their college’s faculty and staff with ice cream, slushies and some shade. Those attending the ice cream social enjoyed making new friends and bonding over shared majors or hometowns. The event also gave new students the chance to get acquainted with some of the faculty members they will be having classes with at SIU and provided parents with one more opportunity to hug their young adults and take pictures before journeying back home. A pleasant surprise for those attending was learning that one of the officers directing traffic during move-in is also an accounting major at SIU! The social was just the beginning of the special welcome students are receiving at SIU. 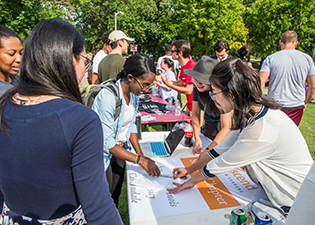 The good vibes and friendly atmosphere continued at the Welcome Back Fest on Aug. 30. This fun festival provided another chance for students to meet one another, as well as faculty and staff, and learn about different campus organizations and activities. Participants got to enjoy delicious barbeque and good music and get free Saluki swag. Catered by Pat’s BBQ and Catering from Murphysboro, the fare included pulled pork sandwiches, chips, and cookies. Students visited the various Registered Student Organization (RSO) tables which featured displays incorporating this year’s theme, “The Great American Eclipse.” The RSO table that most successfully integrated the theme won a pizza party. For the second consecutive year, the American Marketing Association (AMA) took top honors, earning pizzas for their second meeting. AMA, a national organization with more than 370 collegiate chapters across the United States, exposes students to leadership opportunities, career planning, professional development, marketing concepts and community service. The RSO provides a solid networking community connecting marketing students with professionals in their field, helping them better prepare for successful careers. Nearly 300 people attended the 2017 Welcome Back Fall Fest! The college’s faculty, staff and administrators were on hand to reconnect with returning students and get acquainted with newcomers. Highlights also included the Business Placement Center’s tie tying contest, held to emphasize the significance of learning this skill, and special visitors, including a cute black puppy that charmed many of those in attendance. As the semester continues, numerous events and activities, including the University Career Fair and football tailgating will continue to serve as opportunities for CoB students, staff, faculty and business professionals to cultivate relationships, learn, grow and enjoy the best that SIU has to offer.